Which Magnet should I choose, how many points do I have, how many points gets you in, what’s the best way to bank points, what are my odds, am I trying to get in, am I trying to NOT get in, what if I do get in, what if I don’t get in, what if… So. Much. Angst!!! Take a deep breath and trust you’ll get through this. The Magnet lottery is the first in a series of public school options one can apply to with its application window opening November 1st for the following fall. (Charter and other applications typically become available after the new year.) The hard part is you only get to choose ONE magnet school to apply to, and after that, there’s nothing you can do but sit back and wait to see how you did. The Magnet/Choices applications are (finally) online! Some old-school paper applications were sent to local schools and some public libraries, however most parents are encouraged to apply online. It’s fast, it’s easy, it’s paperless! And did I mention that it’s online?! Deadline to get that application in is Friday, December 16, 5pm. After that, most LAUSD schools will close for a 3-week Winter Break. Magnet tours are happening now folks, so get out there and tour! Your child must be 5 by November 1, 2012 to enter Kindergarten in Fall 2012. Remember, LAUSD’s Fall 2012 school calendar will now start on August 14, 2012. Overcrowded points are becoming virtually extinct. Only 2 schools (Del Olmo EL and Cahuenga EL) will remain on a concept 6 (3 track) calendar by 2012, making those students the only ones eligible for the additional 4 Overcrowded points. For everyone else, it means the most points we could possibly accumulate is: 12 Waitlist or 12 Matriculation + 4 Phbao + 3 Sibling = 19 points max. A more even playing field. Must be a resident of LAUSD. 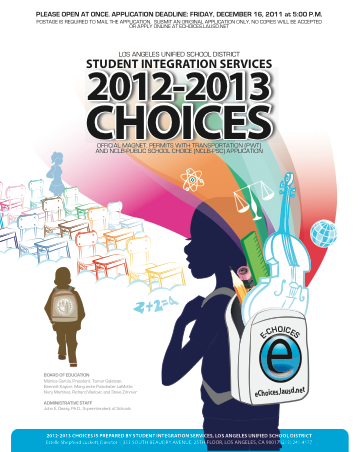 You only get to choose ONE program (Magnet or NCLB PSC or PWT if eligible). You only get to choose ONE Magnet school. No early applications – apply in the winter before the fall of age-appropriate enrollment. It’s a weighted lottery so the more points you have the better your chances are. If you are offered a spot and turn it down you lose all your accumulated wait list points. It’s a random lottery so anything can happen. For NCLB-PSC or Public School Choice – you must be currently enrolled in a PI school to take advantage of that program. Transportation is available if you live outside a 2 mile radius from the magnet school’s attendance boundary for K-5, or 3 mile radius for grades 6-12. Stumped on all this Magnet talk? Come to my last-minute seminar, Navigating The School System: Know Your Public Options, Sunday, December 11th at 5p in WLA and we’ll go over all this and more. Tanya Anton is the creator of GoMamaGuide.com helping parents demystify and navigate their public school options in Los Angeles. To read more articles by Tanya or to learn about her Guidebooks, House Chats, Consultations, and popular Seminars, visit GoMamaGuide.com or email us at GoMama@mac.com. This entry was posted in Featured Articles, GoMamaGuidance, Public School and tagged choosing a school, eChoices, Gifted eligibility, LAUSD, Magnet lottery, Magnet Schools, points, school choice, school enrollment by gomama. Bookmark the permalink. get advice from other experienced people that share the same interest. What’s up colleagues, its impressive postt about tutoringand fully explained, keep it up all the time. attention? I mean Magnet Madness: The Recap | GoMamaGuide is a little vanilla.